convenient trading location. 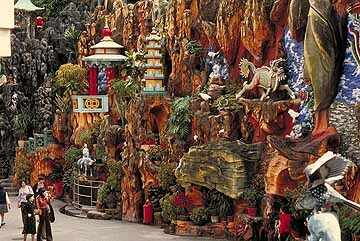 Hong Historic Tiger Balm Gardens in Hong Kong Kong appeared to be no more than a barren rock until mainland Chinese fled to the city in order to escape Communist rule. The influx of Chinese immigrants brought many wealthy businessmen to the area. At this point Hong Kong became a major financial force to be reckoned with. Under the Sino-British joint declaration that was signed between Britain and China in 1984, Hong Kong was to be returned to China in 1997. Today, Hong Kong can be divided into three parts: Hong Kong Island, the New Territories and Kowloon. home to exclusive shops and trend-setting fashion houses. The Stanley Market offers a wide variety of wares. Vacationers will find everything from leather clothing to porcelain. Kids will be begging to go to Ocean Park/Waterworld. The shark tunnel, butterfly house, Dinosaur Trail and roller coaster will please kids of all ages. Architect lovers will revel in the enormous skyscrapers that fill the city's skyline. There are also over 200 islands surrounding Hong Kong. Cruise Ship in Hong Kong Harbor To escape the hustle and bustle of the big city, various ferry companies provide transportation to and from many islands. 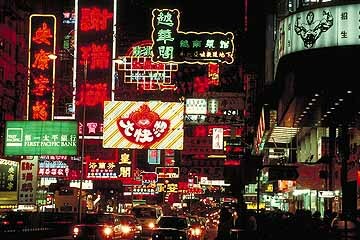 Across from Hong Kong Island lies the peninsula Kowloon. The Hong Kong Museum of Art is bursting with Chinese artifacts including beautiful bronze, jade, bamboo and ceramic pieces. In China, jade is thought to have immense spiritual powers. Head over to the Jade Market and take home a souvenir. Over 400 stalls are set up selling this precious stone in various shapes. The Temple Street Night Market is a fascinating place. Fortune tellers read the future and venders hock their wares. There is even a Chinese opera performance. 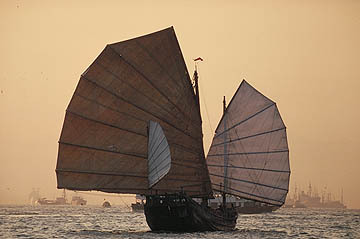 The Waterfront Promenade is Kowloon's cultural epicenter. Located in this area is the Hong Kong Cultural Center, the New World Complex, the Clock Tower and the Space Museum and Theatre. The Planetarium Sky Show is located next to the Cultural Center complex at the waterfront in Tsim Sha Tsui. This is one of the largest planetariums in the world. The New Territories are 200 square miles in size and remain predominantly undeveloped. 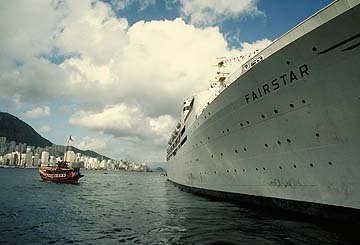 Everyday throughout the year cruise ships deposit throngs of vacationers on the shores of Hong Kong. Numerous cruise lines have ships that not only make stops in this intriguing city, but have ships departing from it as well. To visit Hong Kong and other exotic cities such as Fiji, Bangkok and Singapore, book a vacation cruise today. Before vacationers have even left this enchanting city, they will already be planning their next trip back.